To begin with, I remain Long the Treasury Bond market and continue to imminently expect a relatively sharp, straight up sort of move into the mid 140’s. As pointed out in my last newsletter, http://www.crokerrhyne.com/newsletters/05-23-14.htm , Bonds have historically ended bull moves somewhat dynamically…often making 5-8 point moves in 5-10 trading days…and I expect the move up we’ve had since January to end no differently. For this reason (and others stated in recent newsletters which can be accessed in the crokerrhyne.com newsletter archives), I CONTINUE TO STRONGLY RECOMMEND BUYING THIS MARKET. Prices for options listed anywhere in this newsletter include all fees and commissions. I would once again point out that Small Speculators are STILL have near record level Short Positions in the Ten Year Note contract. I trade the Bonds but the 10 Year Note is what all the talking heads yak about…And even though Bonds have been rising (and interest rates falling), with the media still spewing rhetoric about “rates gotta go higher”, all those little guys, now dead wrong for six months, are STILL trying to be short. For all the reasons I have expressed at length in previous newsletters (which can easily be found in the crokerrhyne.com newsletter archives), I still see the Treasury Bond market as heading for the 150 area during the next year or so…Fed Tapering doesn’t matter…Inflation doesn’t matter…A 1000 talking heads telling you “rates have to go up” doesn’t matter. There is a globe full of buyers who HAVE to buy quality fixed income debt EVERY day, no matter what interest rate yield the instrument provides. US Treasuries are the safest piece of long term paper on the planet and the entire world’s bond buyers have been gobbling up every long term debt instrument the United States issues…and they will continue to do so. BONDS ARE IN A BULL MARKET. Rates DON’T have to go back up. They can stay at these levels for years…which is exactly what I expect to see. I’M STILL LONG TREASURY BONDS AND STILL BUYING. Friday morning I had an interesting comment from an old Midwestern friend who has been on the cash side of the Corn and Soybean business as a fairly large processor for the last 35 years…From a lifetime of experience, this guy KNOWS the markets and I have long considered him as having as strong a grasp of grain fundamentals as anybody, anywhere, in the commodity arena. And I couldn’t agree more…As I have said for years, the markets are nothing but a giant mob psychology game. No values are real. Nothing is constant. It’s all about perceptions, fear, greed and capital jumping all over the place. With this understanding forever in mind, and while realizing nothing is absolute in trading, I am therefore always on the lookout for unanimously agreed upon “logic”, as, more often than not, that “logic” is either flawed but still being parroted mindlessly by talking head after head…OR the logic is valid but has already been 150% accounted for in market prices. I AM A BUYER. WITH THE CASH MARKET CURRENTLY ABOUT $14.25 A BUSHEL AND NOVEMBER 2014 SOYBEANS AT $12.21 A BUSHEL (a $2.00 discount), I THINK EVEN THE SLIGHTEST HINT OF POOR WEATHER (TOO WET, TOO DRY, WHATEVER) OR EVEN THE SLIGHTEST UPTICK IN DEMAND COULD SET NOV BEANS INTO A STRAIGHT-UP MODE. In other words, it’s June. I think the odds of a weather perfect next 4 months are low…and with world demand doing nothing but RISING year after year…and with Beans having seen $16 and $18 highs during the past two summers… AND with EVERY analysis I’ve seen saying, “Sell”, I like putting my money on the long side of this market, with, I believe, a $2-$3 a bushel rally (10K-15K per futures contract) being a VERY real possibility. production for corn, wheat, rice, and soybeans all were at record levels in 2013. Here is an excellent picture of why “global demand is expected to remain strong”. In other words, it remains strong but because it RARELY declines year over year. In fact, the 2008 world financial crash produced the only decline in demand during the entire 30 years shown here. 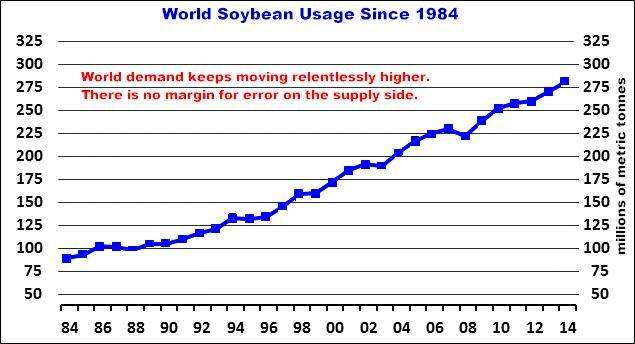 Admittedly, world production has been climbing as well (if it hadn’t, we’d be at $50 soybeans), but the balance between supply and demand really has ZERO room for error on the supply side. ANY disruption in production, or even the threat of it, could send Beans $2-$4 higher in no time at all. And check this out...Small Speculators have FULLY bought into the idea of Soybeans going lower…THEY ARE THE MOST SHORT THEY HAVE BEEN IN 10 YEARS. No, just because these guys are short at historical levels does NOT mean Soybeans have to go up…BUT I WILL TAKE THIS BET…especially NOW as we head into the summer months. For my money, you own this now, BEFORE those first whispers about “iffy” weather start showing up in the media. 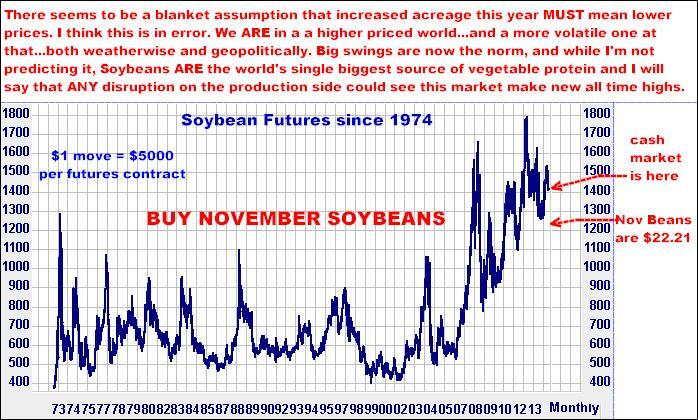 The bottom line is I am absolutely an immediate buyer of November 2014 Soybeans, with some additional funds going to the August 2014 contract…To reiterate, this crop is barely in the ground…FAR from “made” and my perception is the whole commodity world is overwhelmingly bearish…Demand IS strong. The weather IS changing. And I just can’t believe that all those bearish analysts…and especially those record short small traders…are even going to come close to collecting on their bets. To the contrary, within the next few months I think we will see them all clamoring to get long the market…but at prices FAR above where they are today…It’s just how this stuff works. You know it. I know it. If you DO following the ag markets, see for yourself if you can find ANYBODY bullish new crop soybeans…I know they must be out there but I haven’t seen them. More to talk about…Specifically Cocoa and Cattle but it’s Father’s Day and I am supposed to be relaxing…So I’ll leave those market for later this week. My feeling is Treasury Bonds and Soybeans are both IMMINENTLY ready to go and I wanted to get something out a quickly as I can…As such, this piece goes out unedited so apologies for any errors or incoherencies. Give me a call…whether you have an interest or just to say hello…You know me. I always like hearing about what you are doing out there in the real world. The author of this piece currently trades for his own account and has financial interests in the following derivative products mentioned within: Treasury Bonds, Soybeans.